Whether you are a blogger, a freelancer or an affiliate marketer, you always want to get your payment as easily as possible. But if you are from one of the Paypal unsupported countries like Bangladesh or Pakistan, it might be a bit difficult for you to get your payment. To make things easier, you can use Payoneer global payments service. Payoneer MasterCard is a Prepaid Debit Card that can be used in most places where MasterCard is allowed. You can also withdraw Payoneer money from your local bank and any ATM in the world that displays the MasterCard®. Payoneer Prepaid MasterCard allows you to have instant access to your cash. Before moving further, I’d like to tell you some amazing benefits of having Payoneer MasterCard. You don’t need to have bank account to get a free MasterCard. You can withdraw money via Payoneer from your local ATM. You can get payments from freelancing sites like Odesk, Freelancer, Elance, Fiverr etc. You can also get payments from US-based companies like Clickbank, Shareasale etc. You can do online shopping or you can use it in stores that support MasterCard. You can apply for a Free Virtual US bank account from your Payoneer account. You can also make money through its ‘Refer a Friend’ program. Applying for Payoneer card is extremely easy. 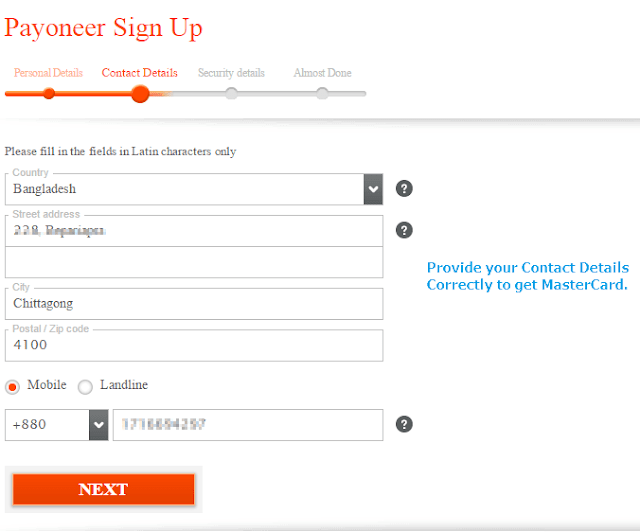 All you need to do is, sign up on Payoneer.Comand wait for the MasterCard to arrive. 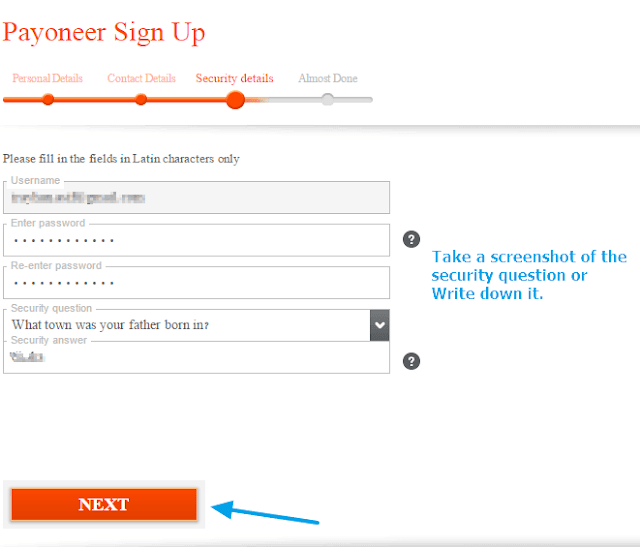 At first you need to create a Payoneer account. Now the GOOD news is, by following this link you can get $25 free bonus when you activate the card. Follow this link Sing Up and click on ‘Sign Up Now’ button. On the next step, you need to enter your Name, Email Address and Date of Birth. Make sure you provide the name and date of birth in accordance with your National ID/Passport/Driving License. Click on ‘Next’. Now you need to enter your contact address. Make sure to enter the correct Address, City and Postal Code. Your MasterCard will be sent to your provided address. On the next step, you need to specify a Password and a Security Question. Take a screenshot of the security question’s answer or write it down on the notepad. Security Question will help you to retrieve password if forgotten. Now you will have to verify your account by providing Driver License or Passport or National Id information. Select a type of Government ID and provide information in accordance with that ID. Then check all the terms and click on ‘Order’ button. 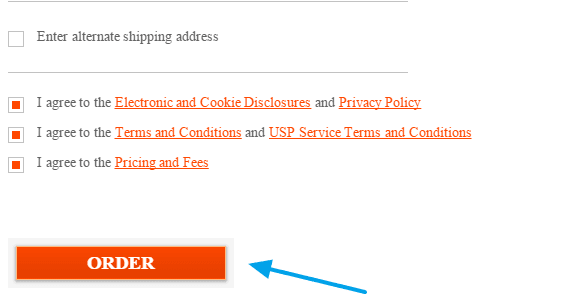 Then you will get ‘Order Card Confirmation’ email. Once Payoneer Prepaid Debit MasterCard has been approved, your card will be shipped. It may take 7 to 10 days depending on your location to get your card on hand. Activating a Payoneer card is very easy. 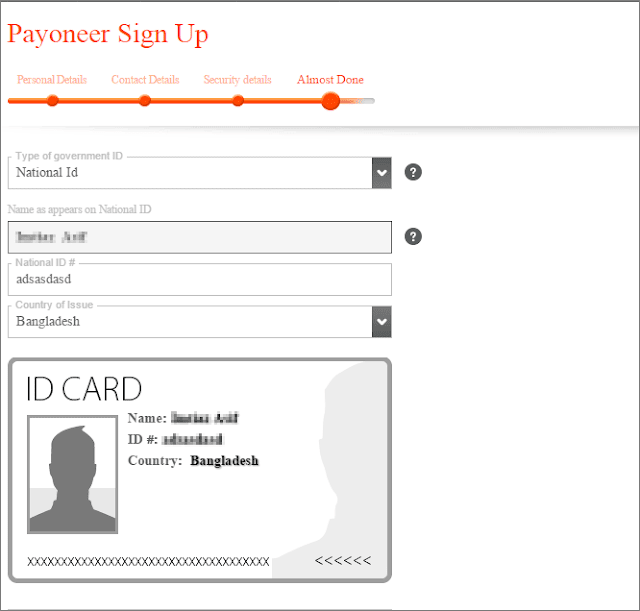 Once you’ve received your card in your hand, login to your Payoneer account using your Username and Password. Username is usually the Email address you’ve used while applying for the card. 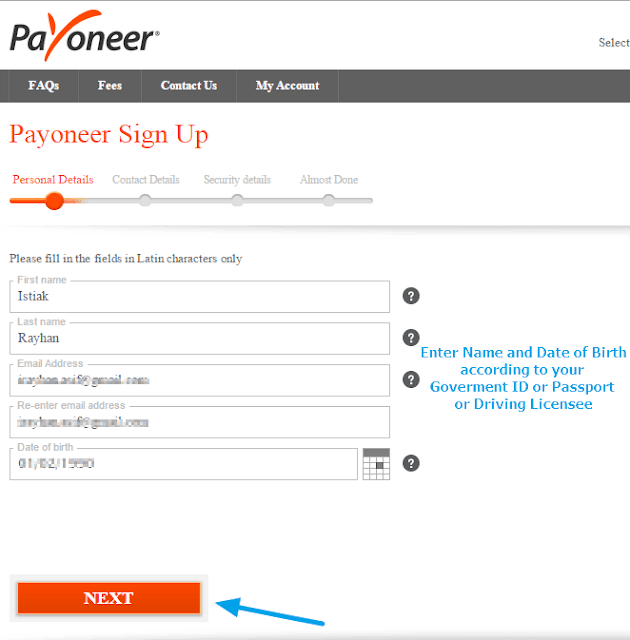 Now you need to enter the ’16 digit card number’ so that Payoneer can verify that you’ve received the card. Then choose 4 digit PIN that you will be using in ATMs and stores. Don’t forget these 4 digit. Click on ‘Activate’. On the next page, it will be confirmed by showing a message “Your request was successfully performed”. You will also receive an Email confirming your activation success. Now you can start using the card. Once you’ve activated the card, it will show $0.00 on your account. To get $25 bonus, you’ll have to receive at least $100 to your Payoneer account. Now let’s see how can you load money to your Payoneer account. You cannot transfer money to your Payoneer account from any credit card or debit card or from the local bank. Currently, there are two main ways to add funds to your card. Bloggers, Freelancers, and Affiliate Marketers can get payment from the companies that support Payoneer payment method. Here are some popular companies that offer Payoneer payment. Freelancing sites: Elance, Odesk, Fiverr, 99Designs, Freelance etc. Affiliate Networks: Shareasale, Commission Junction, Clickbank, Envato etc. Advertising Networks: Buysellads, Infolinks, Revenuehits, Qadabra, Kontera etc. This service allows Payoneer account holders to receive payments from US-based companies. You don’t need to be a US resident to receive money from US based companies like Amazon, Clickbank etc. All you need to do is, use ‘US Payment Service’ of your account. You can also add funds by making money through Payoneer Affiliate Program. Payoneer offers you to make money from their Affiliate Program which is known as ‘Refer AFriend‘ program. The amazing thing about the program is, whoever joins through your affiliate link will get $25 bonus. Once s/he receives at least $100 in payments, you’ll get $25 reward. It’s a win-win deal. To sign up for the affiliate program, login to your account. Then click on ‘Refer a Friend’ button from the upper right. On the landed page, you will get your affiliate link. Now promote your affiliate link through your blog or social networking accounts. You can withdraw Payoneer money to your local bank account or local MasterCard supported ATM. Let’s see how to withdraw Payoneer funds to local bank account. At first, you need to submit your bank account for approval. Follow these simple steps. Go to “My Bank Account” under ‘Withdraw’ from main menu. Confirm your account ownership by entering Full card number, Card CVV, Date of Birth and Payoneer Account Password. On the next page, enter your Bank name, Branch name, Account name, Account number and Bank account description. Checkmark the terms & conditions and click on ‘Finish’ button. 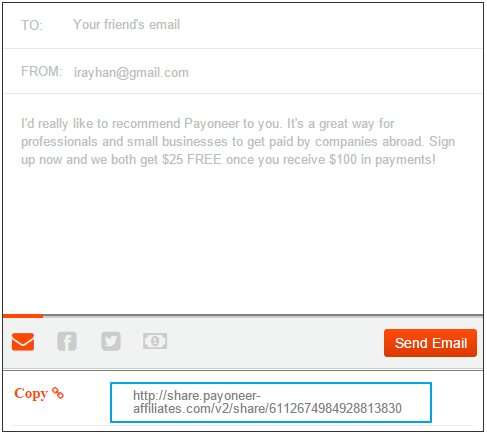 Payoneer will send you an email confirming bank account approval. Once you account has been approved, you can withdraw money to your bank account. Just follow these steps. Login to your account and go to “My Bank Account” under ‘Withdraw’ menu. Select your bank account and enter amount to withdraw. Click on ‘Continue’ button and confirm your withdrawal. You will get your payment within 2-3 days. You can withdraw Payoneer money from your local ATM booths. Just make sure that the ATM is MasterCard supported. Any ATM with MasterCard logo accepts Payoneer Card. You will be paid to your local currency. Hope this post helps you to get a free Payoneer MasterCard. If you have any questions regarding Payoneer Master, feel free to ask me via comment.